Jed Emerson in The Blended Value Proposition: Integrating Social and Financial Returns, volume 45 issue 4 of the California Management Review, says “In truth, the core nature of investment and return is not a trade-off between social and financial interest but rather the pursuit of an embedded value proposition composed of both.” He goes on to discuss how for-profit and not-for-profit companies are evolving beyond their legal forms and that these forms will need to somehow in the near future merge. Companies are forming wholly owned subsidiaries, minority interests, partnerships and joint ventures across these forms of ownership in order to meet their social responsibility to all stakeholders. There are many companies that have not begun this transition and a few like The Gap and Procter & Gamble who are in transition. A few have succeeded in blending the triple bottom-line of economics, social and the environment into value creation. One such company is the Sekem Group. The Sekem Group started as an agriculture based industry thirty-three years ago and has organically developed into a group of businesses, suppliers, and institutions with a global reach clustered around the base industry of agriculture. While many have referred to members of this managerial class as “social entrepreneurs,” the label “21st Century Manager” focuses less on “start-up” skills then those required for sustainable management of modern corporations. While some may have begun as social entrepreneurs, they must evolve into 21st Century Managers if they are to ultimately survive. They must engage in more than simply the social application of entrepreneurial skills and practice. At their best, they must create new knowledge and live within a higher level of economic, social, and environmental integration (Emerson 39). 1977 SEKEM was established by Dr. Ibrahim Abouleish, on an area of 70 hectares of desert sand. Biodynamic cultivation of the land started. 1981 SEKEM sent the first shipment of medicinal herbs and food ingredients to the U.S.A.
1981 SEKEM launched its first product line of herbal remedies on the local pharmaceutical market under the brand name SEKEM HERBS and foodstuff was introduced to the local market under the brand name ISIS. The ASSOCIATION FOR CULTURAL DEVELOPMENT IN EGYPT was founded as a non-profit, non-governmental organization (NGO) in Germany. 1983 The EGYPTIAN SOCIETY FOR CULTURAL DEVELOPMENT (SCD) started its activities with employee training in the arts and science. 1984 ATOS PHARMA was established as a joint venture company between SEKEM, Deutsche Entwicklungsgesellschaft (DEG) and Dr. Schaette KG, to develop the Egyptian natural pharmaceutical market. 1986 The first SEKEM Kindergarten and the MAHAD Adult Training Institute were established. 1987 LIBRA EGYPT was founded as a company specialized in packing and exporting fresh fruit and vegetables to Europe. 1988 The SEKEM School started with primary and secondary stages. 1990 ATMOS PHARMA set up regional sales or distribution offices in Alexandria Assiut and Mansoura. LIBRA EGYPT started, in cooperation with EOSTA and Organic Farm Foods, the export of organic fresh fruits and vegetables to Europe. AGRICULTURE IN EGYPT (COAE) as an independent certification body, working in accordance with Demeter guidelines and later the European Regulation for Organic Agriculture. 1993 LIBRA for Organic Cultivation was established to coordinate the organic cultivation of cotton and all other crops organically grown in Egypt. 1994 CONYTEX, a new company for manufacturing Organic Cotton Textiles was established. The EGYPTIAN BIODYNAMIC ASSOCIATION (EBDA) was founded as an independent non-governmental organization to provide agricultural training and consultancy services in Egypt. 1995 ATOS PHARMA launched a range of phyto-pharmaceuticals and started clinical trials in different medical departments at all university hospitals in Egypt. 1996 HATOR, a company for Fresh Organic Produce was established. Nature’s Best Shops were opened in Cairo to sell organically cultivated healthy food product and organic textiles. EGYPTIAN SOCIETY FOR CULTURAL DEVELOPMENT opened the SEKEM Medical Centre. The INTERNATIONAL ASSOCIATION OF PARTNERSHIP (IAP) was established between SEKEM and many of its business partners. 1997 SEKEM, ATMOS PHARMA, CONYTEX and HATOR were ISO 9001 certified for the first time. ISIS was founded as a company to manufacture organic foodstuff. The SEKEM VOCATIONAL TRAINING CENTRE (VTC) and ART SCHOOL were established by the EGYPTIAN SOCIETY FOR CULTURAL DEVELOPMENT. A Literacy Program for disadvantaged children was introduced. 1998 LIBRA opened its new mill and cleaning line for cereals, rice and dry legumes. 1999 The CENTRE OF ORGANIC AGRICULTURE IN EGYPT (COAE) attained accreditation according to the international quality management procedures for product certifying bodies (EN45011). 2000 SEKEM ACADEMY FOR APPLIED ARTS AND SCIENCE was founded and started research in the fields of medicine, pharmacy, agriculture and arts. The COOPERATIVE OF SEKEM EMPLOYEES (CSE) was founded. 2001 The SEKEM Holding was established for the purpose of supporting, supervising and evaluating Sekem’s companies. The SEKEM INFORMATION AND MANAGEMENT SYSTEM (SIS) was introduced by all companies. ATOS PHARMA installed a new pilot extraction unit for medicinal plants. LIBRA extended its capacity by building new greenhouses, stable for cows and chicken farms. 2002 The International Finance Corporation (IFC), one of the World Bank affiliates, and DEG participated in new investments of the SEKEM Group of Companies. SEKEM ACADEMY FOR APPLIED ARTS AND SCIENCE built pharmaceutical and soil fertility laboratories. 2003 SEKEM received the Alternative Nobel Prize or Right Livelihood Award. The jury sees in SEKEM “a business model for the 21st century in which commercial success is integrated with and promotes the social and cultural development of society through the “economics of love.” Dr. Abrahim Abouleish was selected as an “Outstanding Social Entrepreneur” by the Schwab Foundation. Citrus fruit and potatoes were among the first products sold as fair-trade certified by FLO Germany. SEKEM ACADEMY started training courses for Eurhythmy at the workplace. 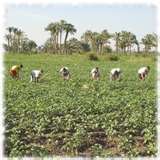 2004 SEKEM and Acumend Fund are financing a project to increase the growth of the organic cultivation of the land and the number of Egyptian farmers. The EGYPTIAN SOCIETY FOR CULTURAL DEVELOPMENT together with the University Witten/Herdecke formed a consortium with Cairo University, Helwan University, Zagazig University, Antwerp University, Marburg University, King’s College London and the University London School of Pharmacy to carry out the EU project DOPSE-TEMPUS to develop a phyto-pharmacy curriculum. 2005 The EGYPTIAN SOCIETY FOR CULTURAL DEVELOPMENT was renamed SEKEM DEVELOPMENT FOUNDATION. The SEKEM Europe GmbH was founded in Germany to provide services to SEKEM HOLDING. LIBRA developed and implemented new greenhouse technology. Introduction of biotechnological conversions of agricultural residues to nutrient enriched animal food. ATOS PHARMA established a joint venture with the multinational pharmaceutical company in Jordan. SALIS, a new IT company for software engineering, was established. SALIS achieved the first place against 400 competitors at a competition for innovative business plans organized by the Egyptian Ministry for Communication and IT. 2009 “Heliopolis University for Sustainable Development” was approved by Mr. President, Hosni Mubarak, through the Presidential Decree No. 298 on the 31st of August, 2009. 2011 Heliopolis University to open in 2011 with Bachelor degree programs in the first 4 faculties (Engineering, Business and Economics, Pharmacy, and Agriculture). Sekem Group is an agribusiness with five business units: Biodynamically grown fruits and vegetables from their farms and a network of farmers in the region; a processing facility; production and processing of Biodynamic cotton and related textiles; IT company for software engineering; and “a pharmaceuticals firm producing herbal extracts and medicinals (Emerson).” Their 2007 financial statement shows a net profit of $12 million or about 50% increase over the 2006 net profit of $8 million (Sekem). Sekem, with nearly 2,000 employees, continues to innovate and grow while meeting the needs of their community and other stakeholders. “Each employee develops a career, personal, and health development strategy that is supported by the firm (Emerson 48).” Sekem has developed an organization which can blend environment (through Biodynamic agricultural principles), economics (through the 5 business units), social (through the support of employee rights, etc…) and cultural (educational programs, etc…) while creating value. Egypt is a poor country with existing economic clusters around farming (cotton, etc..), furniture, textiles, and operational technologies. Yet during these trying economic times its clusters continue to grow. According to the Global Competitiveness Report (GCI), Egypt’s State of cluster development rank had improved through the past three years 2007-2009 from 61 out of 178, 46 out of 181 and 41 out of 183 respectively. Such improvement is due to recent policymakers’ interest in supporting the existing clusters and establishing new ones, as they believe that innovation and creativity is an important mean to develop clusters where new models and high level of innovation would eventually lead to leapfrog into higher value added activities. (El Baradei). There is a lot of interest in developing countries of the Middle East with support coming from both wealthy Muslim (Turkey, etc.) and western countries (Germany, UK, etc.). Sekem Group has established distribution points in a number of global markets through cooperative ventures and strategic alliances. They sought partners who could complement their strengths and advance their corporate culture. Sekem has also managed to draw much global support through grants, low-interest loans and traditional investment in their companies which is reflected in the continued growth of their business units, social and cultural organizations (Abouleish). The Sekem Group, although not the size of a P&G or Microsoft, is a core group of related companies that has exhibited the characteristics of a dynamic cluster which continues to grow new initiatives such as SALIS (IT Company – 2005) and “Heliopolis University for Sustainable Development” approved in 2009 and set to open in 2011. Firms inside a cluster must also have sufficient access to world markets to be able to sustain their efficiency and competitiveness. Thus, a dynamic cluster is characterized by three distinct dynamics: local dynamism, global attractiveness, and global market reach (Solvell, Lindqvist and Ketels 24). The enthusiasm for my work, for all those around me, a community in which people of all nations and cultures work and learn in peace as a symphony. A community in which vocations from all walks of life, all age groups and all levels of consciousness, acknowledge, nurture and love the divine world and strive towards noble ideals. A living, regenerating community maintaining its dynamism by reaching towards the science of the spirit, the Ightihad (diligence). A community pursuing truth and tolerance, generously offering its understanding in service of earth and man. A community where modesty and diligence prevails over vanity and comfort, and all endeavors are blessed (Sekem 72). Abouleish, Ibrahim. Sekem – A Sustainable Community in the Egyptian Desert. Edinburgh: Floris Books, 2005. “Engaging in Cross-Border Collaboration: Managing across Corporate Boundaries.” Beamish, Paul W and Christopher A Barlett. Transnational Management – Text, Cases, and Readings in Cross-Border Management. 6th Edition. New York: McGraw-Hill Irwin, 2011. 510-524. Blanke, Jennifer, et al. The Global Competitiveness Report 2009-2010. Economic Report. Geneva: World Economic Forum, 2009. El Baradei, Mona. “News – Africa – PACF: Cluster Development in Egypt .” 20 May 2010. TCI Network. 27 June 2010 <http://www.tci-network.org/news/card/69&gt;. Emerson, Jed. “The Blended Value Proposition:Integrating Social and Financial Returns.” California Management Review Vol. 45, NO. 4. Vol. 45. 4. Berkeley: The Regents of the University of California, Summer 2003. Porter, Michael. “Clusters and the New Economics of Competition.” Bartlett, Christopher A. and Paul W. Beamish. Transnational Management – Text, Cases, and Readings in Cross-Border Management. 6th Edition. New York: McGraw-Hill Irwin, 2011. 195-209. Sekem Group. Sekem. 2006. 26 June 2010 <http://www.sekem.com/english/default.aspx&gt;. Sekem. Sekem Sustainability Report 2007. Sustainability Report. Cairo: Sekem, 2008. Solvell, Orjan, Goran Lindqvist and Christian Ketels. “The Cluster Initiative Green Book.” 2003.